I've extracted data from California Air Resources Board executive order documents - you can read a list of certified models here. Please check out the original post! So, what's the scoop on the 2009 H-D models? If you know of any good info on the 2009 Harleys, leave a comment below, drop us a line (use the contact link) or send email and we'll check it out... and update this page with details and links as we encounter them. Night Rod Discontinued in 2009? Submitted by Michael Curry on May 29, 2008 - 10:38pm. According to this 1130cc.com thread the Night Rod is being discontinued for 2009. It may be replaced by another variant, but the rumors are flying. Submitted by Okinawa Military Sales (not verified) on June 24, 2008 - 9:20pm. For customers who qualify through our program, this is a very exciting time. 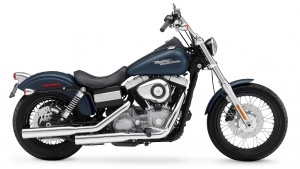 HD has increased their MSRP for 2009 model year. And being true to military has provided a significant price cost savings over the increase. A Touring V-Rod??? Surely you're joking! Submitted by HDLuvr (not verified) on June 1, 2008 - 7:33am. Submitted by nashuaslick (not verified) on June 20, 2008 - 3:14am. Submitted by Livin (not verified) on June 3, 2008 - 6:55am. The 2009 colors listed by fireballin03 are correct; I saw an HD hard bound 2009 color book at my HD dealer in Alabama. 2009 H-D model early info from military sales rep? Submitted by Michael Curry on June 22, 2008 - 10:05am. EXCLUSIVELY to Exchange New Car Sales we have received EARLY confirmation on our Harley Davidson MY 2009 Phase 1 Order!!! The matching has been completed for orders that were pre ordered by customers who already got their order in for a 2009 in the last few months and we DO have some more 2009s (yes really!!!) left over!! Most of these bikes are building in AUG and SEPT, so earliest delivery for these bikes Stateside will be the 1st week of SEPT, earliest delivery date for these bikes Overseas will be the 1st week of OCT!! I have all the 2009 colors available as I received my color chart today AND can show the new 2009 colors (see below) to you. Submitted by Super Six One (not verified) on June 27, 2008 - 1:51am. As an oversea's Military Sales participant, I can confirm this because the bikes were just released, and I got the 2009 type and color I wanted. HD Overseas Sales guys are pro's...!!! Case of Beer Tony...! Submitted by Chuck Rat (not verified) on July 11, 2008 - 3:26pm. Submitted by Michael Curry on June 23, 2008 - 7:21pm. Submitted by feel free (not verified) on June 25, 2008 - 7:48pm. Submitted by 1SG (not verified) on June 30, 2008 - 4:55am. I am on my 3rd tour to Iraq and while here in 03' I ordered an 03' FLTRI and was very happy with them and the bagger as my 2nd Harley. In May I ordered an 09' FLTR at Harley sales guy at the PX I was not able to get the white pearl like I wanted. I have had great dealings with Mil sales. After I get the 09' in I will still keep the old shovel but the 03' is for sale. Submitted by Michael Curry on June 30, 2008 - 6:08pm. Three tours... we can't even begin to thank you enough for your service. Here's to your safe return, and to a lot of great rides ahead! Submitted by Ridgerunner (not verified) on July 18, 2008 - 6:43am. I can't even imagine how difficult 3 tours has been on you, your family & friends, but rest assured, the majority of us out here thank you from the bottom of our hearts, knowing we can never really repay such a debt. ... oh, and ENJOY YOUR NEW RIDE!! Does anyone know how if a veteran can order from a military rep? Submitted by Zach (not verified) on July 2, 2008 - 12:42pm. I put a deposit down on an 09' Nightrain and was wondering how the military order works? I am a verteran and was wondering if I qualify. Also is there a discount? Submitted by Double Dog (not verified) on July 4, 2008 - 11:04am. You need to be on orders downrange for at least 30 days or more. Submitted by Anonymous Coward (not verified) on July 14, 2008 - 6:18am. A retiree can also buy a bike if they are stationed overseas and have logistical support overseas, that equals usually 30 day orders. Submitted by rumormill (not verified) on July 7, 2008 - 8:11pm. H-D first made V-twin engines in 1909, didn't they? Anyone know if they are planning another 'anniversary' edition for that one? More 2009 H-D rumors - water pumpers and massive changes? Submitted by Michael Curry on July 10, 2008 - 8:00pm. cvoharley.com has an interesting thread featuring rumor and conjecture radical changes to the touring line-up. More than just chrome and paint... ...radical enough to warrant the dealers being advised to clear out their 2008 models... even at a discount. Submitted by NO BS HERE. (not verified) on July 13, 2008 - 2:04am. All FLH and FLT models will have a 180mm rear tire. The fender looks pretty bad, similar to a kawi or honda. The exhaust now runs under the bike for the left muffler, no longer going over the motor. extended side covers to help with heat problems. huge frame down tubes, looked like 2 1/2" O.D. Submitted by Bobnoxious1 (not verified) on July 13, 2008 - 2:13pm. WOW!! That is exciting news! I am going to put a down payment on a '09 CVO Ultra then! Submitted by HD dealership Sales Manager (not verified) on July 19, 2008 - 6:51pm. What would 118" be? Why not a Jim's 120 Hmmmm.. Submitted by abidzip (not verified) on July 15, 2008 - 2:53pm. The fender looks pretty bad?? Your scaring me. Looking forward to purchasing 2009 RKC. What does G mean by "huge frame down tubes, looked like 2 1/2" O.D"?? Last hog I owned was a 88 Heritage, so I am rusty on this subject. Submitted by Michael Curry on July 17, 2008 - 8:26pm. There are some interesting photos of the VROD VRSCF here. Rather than filch their photos, we'll direct you to their site -- it looks like you will have to sign up for an account on 1130cc.com if you want to see the photos. Submitted by ShitHead (not verified) on July 19, 2008 - 6:49am. Good God,is that really a Harley? Submitted by Anonymous Coward (not verified) on July 22, 2008 - 2:08am. Submitted by Cameron (not verified) on July 22, 2008 - 4:17am. Submitted by Michael Curry on July 22, 2008 - 3:31pm. You'll find 2009 Harley-Davidson models photos here. We'll be adding more photos over the next few days. Submitted by Expat Stu (not verified) on July 29, 2008 - 10:38pm. I saw a lot of info on military sales on this forum. I will be briefly rotating back to the US in summer 2009 and want to pick up a HD V-Rod. Do military sales really provide that much savings. From what I can tell on the internet, it only seems to be about 8% off the MSRP. I am wondering if I should get a low-milage used bike instead and save a few thousand. Would appreciate anyone's experience with this.